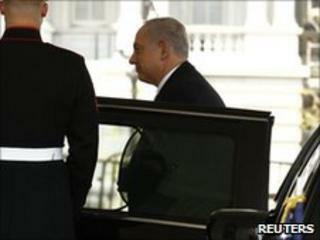 US President Barack Obama is holding talks with Prime Minister Benjamin Netanyahu in Washington. President Obama gave Mr Netanyahu a frosty reception at the White House during their last encounter in March. They are expected to discuss a range of issues, including Iran's nuclear programme and efforts to start direct Israeli-Palestinian peace talks. The meeting comes a day after Israel confirmed it would allow more consumer goods into the Gaza Strip. But it said materials such as steel, cement or certain fertilisers that could be used by Hamas militants would be barred or limited. The White House, EU and Britain have welcomed the move as a "significant step" forward. But Hamas said it was worthless and the blockade should be fully lifted. Last week, Mr Netanyahu said he believed that a main part of his talks in Washington would be "focused on how to start direct peace talks between Israel and the Palestinians right away". Before Benjamin Netanyahu and Barack Obama get down to discussing details of how to restart direct peace talks between Israel and the Palestinians, they will want to show the world that their own personal relationship and, more importantly, that of the US and Israel is rock solid. Mr Netanyahu says he has listened and has since bent over backwards to accommodate Palestinian demands - making positive gestures like the freezing of new settlement building in the occupied West Bank. Palestinian leaders say the Israeli moves are hollow. Officials emphasise the fact that existing, not new, construction continues apace. Analysts say we should not expect too much. Mr Netanyahu does not have much more room for manoeuvre. Members of his right-wing coalition are already demanding a complete resumption of all building in the settlements in September - on the occupied West Bank and in East Jerusalem. The beginning of indirect negotiations in March was halted after Israeli municipal authorities approved plans for the construction of new homes in a settlement in East Jerusalem, which Palestinians want as the capital of a future state. That announcement came as US Vice-President Joe Biden was on an official visit to Israel, and he condemned the decision. When the Israeli PM last visited the White House in March, he was snubbed by President Obama, who refused even to allow a photo of their meeting to be released. Both sides want the atmosphere this time to be much better, the BBC's Middle East editor Jeremy Bowen says. He says Mr Obama and Mr Netanyahu will have plenty to talk about: what comes next in the gathering storm over Iran's nuclear programme; the changing strategic picture in the Middle East, epitomised by Turkey's public falling out with the Israelis over their deadly raid on a Gaza-bound aid flotilla; and how to establish a credible peace process with the Palestinians. However, he adds that - unlike his predecessor - President Obama is prepared to accept that some of Israel's actions are part of the problem in the Middle East. This continues to create irritation - and nervousness - on the Israeli side. The Palestinians broke off direct peace talks after Israel launched Operation Cast Lead in Gaza in late 2008. The Israeli military said on Tuesday it would charge an army sniper with manslaughter for alleged actions during the 22-day offensive. It said in a statement there was evidence the staff sergeant opened fire as the victim walked with a group of people waving a white flag. The operation, which Israel said aimed to stop cross-border Hamas rocket fire, left more than 1,300 Gazans dead, many of them civilians. During his three-day US visit, Mr Netanyahu is also expected to travel to New York, where he will meet UN Secretary General Ban Ki-moon and address Jewish American leaders. Mr Netanyahu cancelled his last visit to the White House, which had been scheduled for 1 June, to deal with the fallout from the Israeli raid on the Gaza-bound flotilla. The 31 May operation, in which nine Turkish activists were killed, sparked mounting international pressure for Israel to ease its four-year blockade of the Palestinian territory. During Tuesday's talks, Mr Obama is expected to press Mr Netanyahu to extend a 10-month Israeli moratorium, which ends in September, on the building of new settlements in the West Bank. But analysts say such a move could strain Mr Netanyahu's coalition government, which includes a key far-right party. Meanwhile, an Israeli human rights group, B'Tselem, says Israel's Jewish settlements have now taken over more than 40% of all the land in the occupied West Bank. The advocacy group's report says Israel "systematically violates" and reinterprets international, as well as its own laws, to take over private Palestinian land, thus undermining peace negotiations for a two-state solution. Advocates of Israel's settlement policy rejected the report as politically motivated.